When I first made the decision to stay at home with Squeaker, I also knew that it would mean not sending her to daycare. I was perfectly okay with this and to be honest, daycare just wasn’t something that we could afford. Most, if not all, of my income would go towards daycare expenses and since I wanted to breastfeed for as long as possible, I knew that staying at home with her would be our best option. It was during one of my searches for early homeschooling that I actually got back into the idea of blogging or at least blogging for profit. From there, I also started to plan out my own Tot School and home preschool plans for Squeaker. Of course, she wasn’t yet ready for all of that but I could at least start with the building blocks, so to speak. One of the ways that I started “homeschooling” her was by reading. This post makes use of affiliate links at no additional cost to you. By making a purchase through one of my links, you are helping me support my family. I want to foster a love of reading with all of my kids and I figure the best way to start is by reading to them and letting them explore books. By exploring books, Squeaker is able to pick them up, look at pictures, attempt to turn pages, touch pictures, and of course chew on the books. She’s using her senses and developing motor skills that will help her later on in life. By reading to her, I create a time just for the two of us. 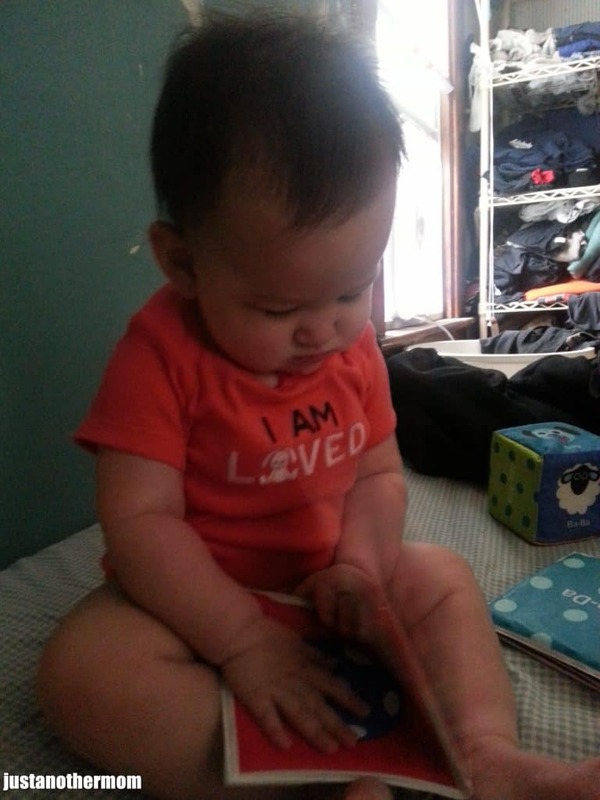 With Squeaker seated in my lap, she can look at the pictures, touch the pictures, see the words, and hear the words. I’ve read to her from a young age, and even when I was pregnant with her- I would read Babar and Madeline. We love books in our home and my goal is to have books available at all times for the kids. So, what would I recommend as far as books for babies? Chunky board books, soft books, and cloth books are wonderful for interacting with. Textures to feel, colorful (or black and white) pictures to engage with all provide learning opportunities just by letting baby play. We purchased a set made by Sassy that included three simple books and a cube. As far as what I enjoy reading with Squeaker, I tend to look for colorful pictures and simple text. Here are a current few favorite hits in our house. Anything by Sandra Boynton, we especially love Barnyard Dance! (Boynton on Board) and Moo Baa La La La – I also created a fun matching game for toddlers based on Moo, Baa, La La La as this is still one of Squeaker’s favorite books! Anything by Eric Carle, we especially love The Very Hungry Caterpillar – be sure to check out my accompanying mini unit & printable puzzle pack! I try to read to Squeaker several times a day, every day; at night as part of her bedtime routine, then at least once or twice during the day. It really doesn’t take that long and I feel that it’s a wonderful opportunity to bond with her. I’m fortunate enough that I can stay at home with her and will likely do so until she’s ready to start kindergarten. I want to make the most of that time, including reading with her daily in hopes that I can pass on my love for reading to her. Growing up, I enjoyed reading independently and being read to; my parents always made sure that I had access to books and in our family, the message was simple- we love books and we love reading. Because of those fond memories, I hope to create a similar love of books and reading with Squeaker. Later on, when she’s ready, books will be heavily incorporated into her preschool routine. I plan to have unit studies revolving around books, similar to Five in a Row, and add in books based on a theme (teddy bears, farm, etc.). I still have many of my chapter books from my own childhood (the Anne of Green Gables Series and the Little House on the Prairie Series) and hope to read them with her when she’s ready. I’m still not sure as to how long we’ll home school, the plans are to not continue after Pre-K, depending on my schedule. But, we’ll see what happens when we get there. We have quite some time until that happens. What books do you enjoy reading with your children? Or, if you don’t have children, what are some of your favorite children’s books? Kori,you can see she loves her books! What a doll she is! I always loved reading to my sons, and now to my granddaughter who is 3! They just learn so much in this early stage of life! It’s amazing! I enjoyed your post! I loved Dr. Seuss & and Little Golden Books.. I recently bought a few book lots on eBay for purposes of building a children’s book library at home.. 200+ we have now. And thank you 🙂 She is my little troublemaker lately, it seems. We had tons of board books for my boys when they were babies. They like to chew on them more than anything else, though, LOL! Yes, lol. She tends to think that most of her books are for chewing so sometimes I have to give her another book if I want to read to her. My fave is “The Very Hungry Caterpillar”. Great book for all kids. That was always one of my favorites to read to my boys. That and Goodnight Moon! I miss the days of reading with my kids when they were little. So important to instill that love early. so adorable to see her enjoying here books. what a great start. Sometimes she definitely loves to chew on them more than be read to. And that’s fine with me 🙂 All part of the growing process. Sandra Boynton has a goodnight book that is really cute. (I bought it after we fell in love with Moo Baa La La La!) We have several board books that my son loves, and a few cloth books I’ve made along the way. Yeah.. the Going to Bed Book, I think it is. We love that one too. Her illustrations are just great and the text is so cute. Great for teaching concepts too. AW!! Yes I always loved reading with my babies. I have written several posts about that too. I see some familiar favourites here in your post too. I love Margaret Wise Brown. She’s one of my all time favourites. I will definitely have to check those out! I love seeing what fellow mom’s have to say about books for their little ones. And yes, I think she’s a classic really. Ours are a little older and just started getting into the Hunger Games series. They love them, and can’t wait to see the movies now! Thank you 🙂 I owe a lot of that to my parents because they encouraged reading (independently and being read to) at a young age with me. I regret that I don’t read as much as I used to but I’m hoping to change that. Yeah, I think that’s key 🙂 If kids see their parents reading or if parents read to kids, they’re really setting them up for success. Great books! My babies loved board books when they were small. Now that is adorable – I can see how they are enjoying the story, even at a young age – PRICELESS! 🙂 I think it’s important to get them reading or at least involved with books at an early age- even if they aren’t always listening. I think it’s great to introduce young children to books. I started reading to my kids and now my grandson at an early age and they loved/love looking at the pictures. I prefer books that allow kids to touch and feel with different textures when they’re babies and when they get a little older the pop up books and hidden pictures. Yeah, I want to get her some of the touch and feel books soon. And I’ve always loved the hidden picture/lift-the-flap books for kids. I loved board books when my girls were younger. Now they like me to read anything they can get their hands on! I started buying books for my kids before I even met my son’s father. Way before I was even planning to have any kids yet. At least fifteen years before I actually had him. I was buying them already in HS, lol. But I just wanted my children to have the best books that I had loved so much in my childhood. I think childhood is party made by the books we are read by our parents and the books that we read by ourselves then. both of my girls LOVE books, they are great and all kids should have as many as possible. no such thing as to many. I completely agree 🙂 One can never have too many books. Books are the one item I am horrible at saying no to buying. We have quite a few of those books you mentioned! I actually started collecting books for my daughter before she was born and now her little collection takes up about 2 shelves! That’s fantastic! I bought a few lots of books on eBay, mostly from retired teachers so they had a great variety. I need to get a new bookshelf for her stuff now. 🙂 Dr. Seuss is wonderful. And I love the newer Dr. Seuss for Babies books that they have. I bought her the Horton Hears a Who one and she loves it! Our favorites at the moment are Don’t Let the Pigeon Stay Up Late and Don’t Let the Pigeon Drive the Bus. My son goes crazy for those books mostly because the pigeon says a lot of things that my son says when he is trying to get me to do something that I already said no to. I agree with your recommendations. I like board books that are chunky, but the soft ones that have touchy feely things on them are awesome for the little ones. 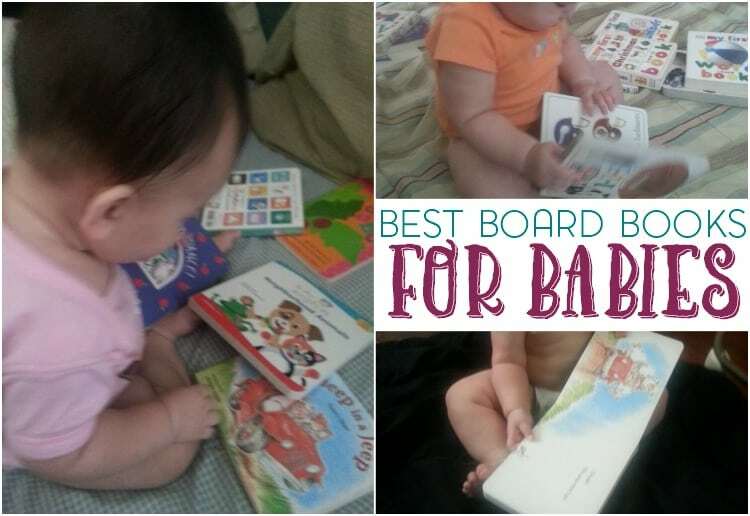 My little one loves board books and textured books! 🙂 Those do tend to be big hits! I love reading to my boys, I’ll love you forever is one of our favorites! That’s a classic and I think a must-have in any home. Oh how cute your baby is. I miss having a baby at home. 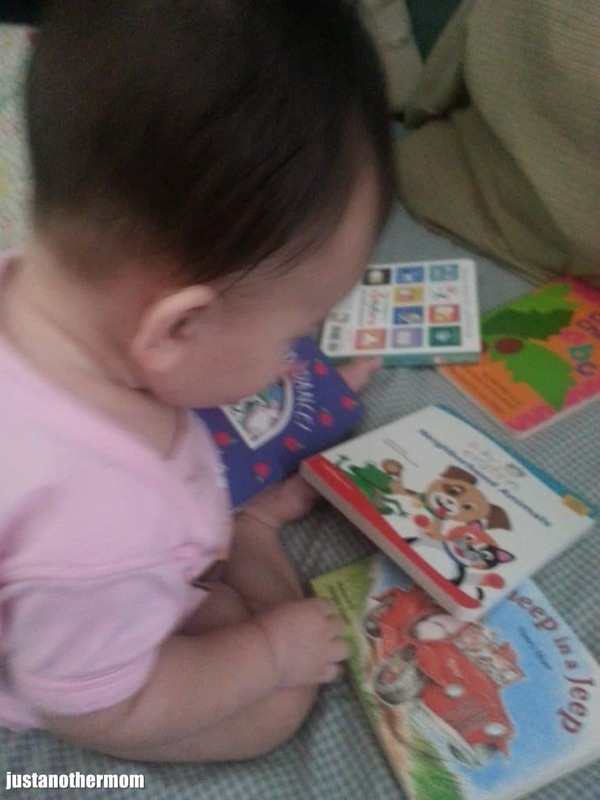 I agree that if you want your kids to be fond of reading, you’d have to start it while they are babies. My little one just turned one and absolutely loves books, also. We should have a book-reading baby play-date! What a lovely doll she is! Those are some of our favorite books! Thanks for linking up to the Love to Learn Linky!